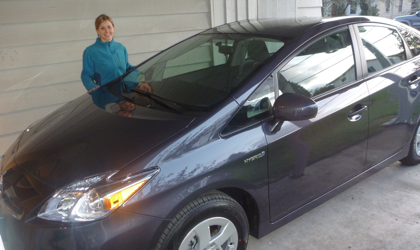 Emily bought a 2010 Prius III today! She got it in a dark grey gunmetal color with the nice JBL stereo inside. She had been waiting for some good incentives from Toyota due to all the recalls they had done with their fleet. They then dropped their APR by a lot after some haggling with the dealership they agreed to her terms and the order was put in. That was Sunday. Two days later and she now has her very own brand new car. Nina the Nissan held out for a long time and Emily had some sad final words for her as she traded her in. No name for the new Prius yet but we can’t wait to try it out on a long trip.